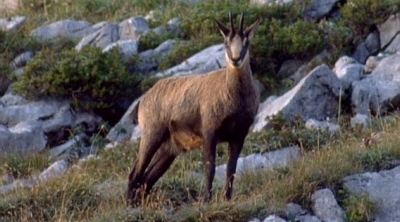 The chamois is primarily through a customs very present in the Alpine area like the so-called "Gamsbart" what would be translated to, chamois beard. The chamois is a biungulates. 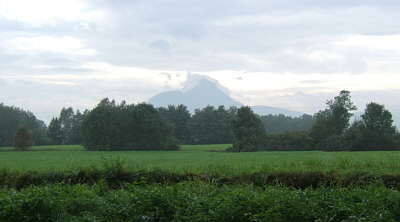 It lives in the mountains and is about as big as a roe, with a shoulder height of 70-85 cm (2.5 feet). Chamois are weighing 30 to 50 kg (up to 110 pounds). Their length is 110-140 cm, its tail is up to eight centimeter long. Chamois are in shape and appearance very similar to goats, but they have grey-black deck hair and on the back a black stripe. The winter coat is darker than the summer coat. Their coat offers good camouflage in the mountains. Chamois are slim, at the head bent backwards, short black horns. The chamois goats have horns like the male chamois. Chamois live mostly in herds of several animals. There are often some females and their young animals and a male. The females, they are also referred to as goats, suckle their young and teach them climbing on steep slopes. The chamois is found in all areas of the Alps, but also in the Pyrenees, the Carpathians and the Anatolia. They eat grass and herbs but also roots and are frugal animals, like their relatives the goats. Chamois are quite shy when they hear a noise or smell people they quickly run away. A natural enemy of chamois is the lynx, wolf, bear and golden eagle. Chamois are also threatened due to snow avalanches and debris avalanches. The greatest enemy are humans, destroying the habitats of the chamois in the mountains. Chamois are hunted. Their trophy is usually horns or the head, and the "Gamsbart". The "Gamsbart" comes from the hair of the back of a grown up mail chamois. The skin, which is fine soft leather and the meat, which is a tasty and popular game.